I'll let you know! I've got quite a few to sell so when I've done my checks I'll send a list over to you. As for the pigs I don;t think i'll let them loose in my veg garden but they're on the cards for next year. Time of the year that we tend to reassess and build up garden layout plans for next year...we're doing the same and it's exciting! Just hope that we get it all done as planned but if not, well...nature will still work it's beauty. Your food garden looks rustic and very homemade. I'm also envious of the green houses...not just one but two!! Nice place to carry on working in even as weather gets cooler. Happy gardening Kev:) and sending you a bit more bright sunshine before winter sets in. It's certainly rustic and homemade! Yeah, I've been thinking about how to improve the layout and make it work better for me, so I've decided now's the time to make a change ready for the next season. The narrower beds are ideas from "the market gardener" and Curtis Stone "the urban Farmer". I think it's best to look at how people are doing it commercially and the scale it down. That said the 4ft beds have been annoying me for a while now, and although I'll have more paths it'll make me more effective when I'm out there if I can keep it all under control better. What a great spot! I am so envious of your greenhouses. I want one to help with our very short season. I have no doubt you can keep up with it all. You have to train those little helpers!! It's a good spot, but it has some downsides, it's on a north facing slope and a bit of a frost pocket. It's a short season here as well but I'm hoping to make up some hoops to give plants a bit of extra heat and time when needed. What a timely post. We are just preparing a new area for raised beds, some of which are rather wide. Why did you go for the narrower ones? I was thinking for us, narrower is losing growing space to more paths. Also very interested on the less weed/more mesh discussion. I think we HAVE bitten off more than we can chew regarding the veg, but I love it and can't wait to see! I always bite off more than I can chew! Each year I expand my growing area and then can't cope. Doing my beds like this means that I'm getting more growing area by controlling what's already in production. The narrower beds means that as everythign is divided up it's easier to manage and using membrane and plastic means that weeds won't be growing when a plot isn't in production. I plant on putting some plots over to green manures as well as leavign some fallow. 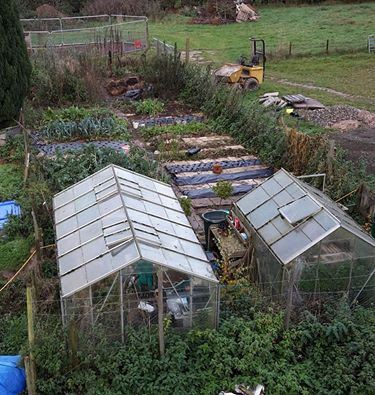 In truth the bottom of the garden is full of docks and nettles and it'll take a bit of time to bring these plots into production and I'll have to cover them for a bit and grow some crops through plastic, it'll be good for squash and stuff. great looking garden kev and i am sure you will add on! I do have another veg garden as well but I've plastic it over this year. I'm planning on moving my fruit up there as it's all got out of hand at where it is now. Just keep in the back of your mind, if the SHTF,you are ahead of the game!